Our public Patient Communication "Portal"
Perhaps the most extensive shift in patient care over the past ten years has been the implementation of computers to maintain patient records and to facilitate doctor-patient and doctor-doctor communications. Offices that have implemented electronic databases simply run much more efficiently and fewer errors are made. I will attempt to explain these benefits to my fellow physicians and the general public. We implemented a new electronic communication system this past year that integrates with our existing scheduling system. Our computers now automatically remind our patients of appointments via email and text messaging. This has made “forgotten appointments” or “no-shows” virtually a thing of the past. This allows our doctors, staff, and patients to optimize their time. Personally, I do not take phone calls from phone numbers unsaved in my phone, and prefer responding “Y” to confirm an appointment from a doctor’s office. The system also allows patients to schedule appointments without even picking up the phone, lets them know when eyewear is ready, and also sends friendly annual appointment reminders without generating printed mail waste or postage. All patients may “opt-out” of this service, of course. Emails and phone numbers that are collected are NEVER shared and are compliant with HIPAA privacy policies. The software also provides the option for our patients to fill out a survey and let us know if we can do anything more. It also compares us to the national averages of customer satisfaction in our field. The staff and I personally read each and every survey. Over a hundred surveys have been returned since we went live less than 6 months ago. Public reviews patients have written are also posted through this system. My patient’s health records went fully electronic almost 2 years ago now. Literally at the click of the mouse, I can view changes in medications, history of eye pressure, every type of contact lens we have tried, history of glasses prescription change, the list goes on and on. Click here to see what is recorded at a regular exam. Before integrating our electronic records, a patient with a question for the doctor would call in with a question and then 1.) staff member grabs a chart 2.) staff member must decipher handwriting [quite poor in my case] 3.) Find the doctor 4.) Doctor has to physically flip through pages and make a decision 5.) Staff member has to call the patient back. Today, a patient may email in (I physically look at our office email multiple times per day between patients), I pull up their records in less than 2 seconds, and respond. I would estimate for the average question, this entire process takes less than a minute of my time. Whereas without electronic communication and records, I would guess about 10 minutes of my staff’s time and at least 2-3 of mine. Our software also allows me to quickly review what has been entered in any exam before I finalize it in just a few seconds. Eyeglass and contact lens prescriptions are subject to transcription errors where poor handwriting/bad ink/multiple photocopies/etc. have affected the legibility of the numbers and signs. This type of error has yet to occur even once in my office and drastically reduces the number of spectacle lenses that need to be remade. All special testing can also be pulled up quickly for the doctor to review and briefly explain to the patient as well. Each of my exam lanes feature large dual displays: One 30 inch screen for data display and entry, and one 50 inch screen for special testing (retinal photos, OCT, visual field) review. Many common eye diseases like macular degeneration, cataracts, and glaucoma require careful monitoring where we watch for subtle changes over time. Our software quantizes all of the measurements/findings I record, compares them to normalized average values for each patient’s age and race, and even plots them into a graph/visual display that is simple to explain to the patient. Most doctors spend hours every week communicating with other doctors about their mutual patients. For example, I contact every primary care doc of all diabetic, glaucoma, and macular degeneration patients I see (sometimes other specialists as well) and all Pediatricians for all children requiring treatment more than simple eyeglass correction, like amblyopia. I would typically write a short letter, and this would probably take about 10 minutes for each patient. Today, there is literally a tab in my database that allows me to select the doctor I wish to communicate with, and all the important info that doctor may need is automatically filled in, I type one sentence summarizing the important findings, and I click “fax”. This process takes less than a minute. Sometimes I do this while I still have the patient in the exam room. I would estimate I send an average of 3-5 letters per day at this point, thus allowing myself over 30-50 extra minutes per day for patient care. What all of these electronic changes have boiled down to is efficiency, saved time, and saved money for everyone involved. I love seeing all of my patients, but they have better things to do than sit around waiting for their appointment in my waiting room. This increase in efficiency allows my staff, associate doctors, and I to save time as well, allowing us to concentrate on the most important things to our patients: Their health, level of care, and customer service. To my fellow practitioners, I encourage you to consider making investments in these types of technologies. While the initial investment may sound expensive, I can assure you that both you and your patients will save time and money in the long run. For every big change that I have made, there has been about a 6 Month training and learning period where things seem more complicated for yourself and the staff, but then one day you think about it, look back, and imaging how you ever managed doing things the old way. As always, please do not hesitate to contact me with any questions. 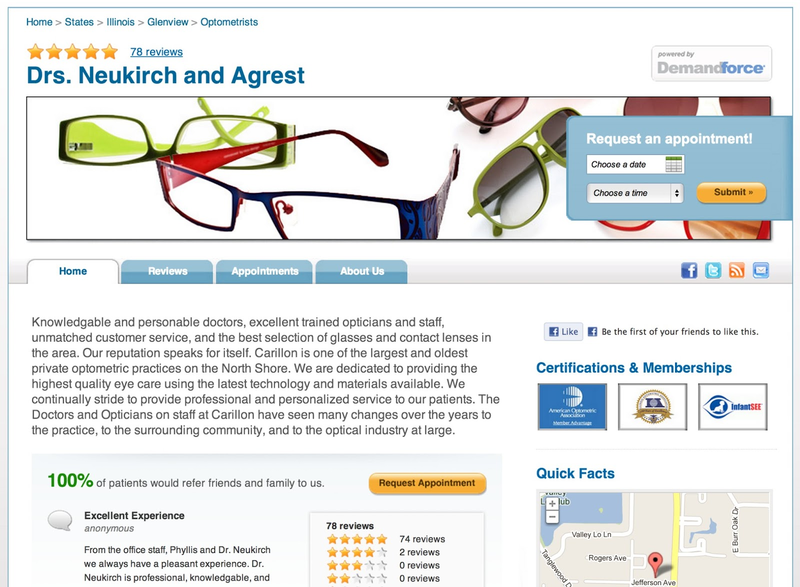 Dr. Andrew Neukirch practices at Carillon Vision Care in Glenview, Illinois. 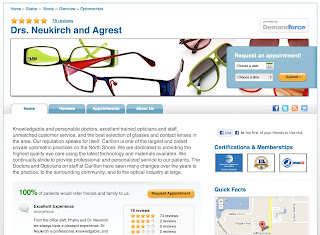 Dr. Neukirch has no commercial interest in any of the 3rd party software companies listed in this blog.